US First Lady Melania Trump steps out of a car as she arrives at Chierici Palace, part of a visit of the G7 first ladies in Catania, Italy, Friday, May 26, 2017. On Friday and Saturday, for the first time all seven are around the same table, including also newcomers Emmanuel Macron of France, Theresa May of Britain and the Italian host, Paolo Gentiloni, forging a new dynamic after a year of global political turmoil amid a rise in nationalism. 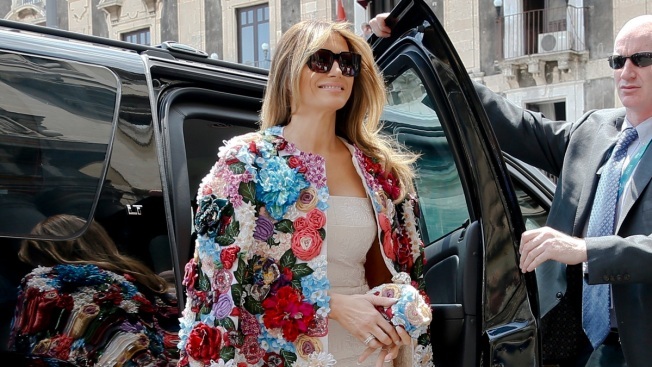 Melania Trump's first outing in the Sicilian sunshine was in a colorful floral applique jacket by Dolce & Gabbana that sells for $51,000, or several thousand dollars below the median U.S. income in 2015. She also carried a matching clutch to lunch with spouses of the G-7 leaders, held at the historic Elephants Palace and hosted by Catania's mayor. The burst of color in the U.S. first lady's wardrobe came after a steady dose of mostly black during President Donald Trump's inaugural overseas tour, including a prim black lace dress with a matching mantilla headcover that she wore to meet Pope Francis, and a dark jacket with golden detailing on the cuff and collar that she wore for her arrival in Italy. 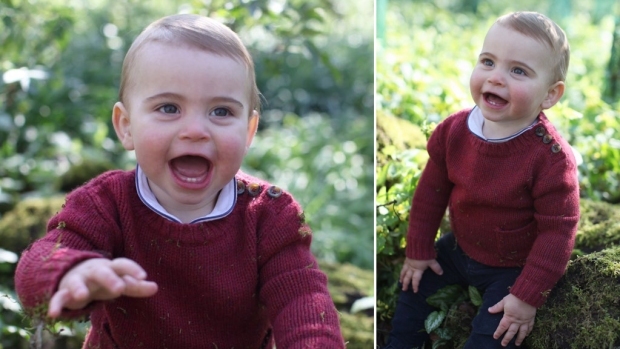 Both outfits were also by Milan designers Domenico Dolce and Stefano Gabbana. Gabbana has celebrated each appearance with Instagram posts. He shared three photos of the floral jacket, worn over a simple white shift dress, with Mrs. Trump looking model-perfect as she stepped out of an SUV. Gabbana tagged the photo with hearts and a "Thank You" to @flotus #melaniatrump. Dolce & Gabbana have made Sicily their fashion muse, so it made sense that Trump's wife would wear their designs in Sicily, the final stop on Trump's trip. The White House did not respond to requests for comment on how much Mrs. Trump, a former model and the wife of an independently wealthy president, paid for the jacket. The U.S. government does provide first ladies with a wardrobe allowance. Several fashion designers have said publicly that they will not dress the first lady because they oppose her husband's policies. The retail price for the Dolce & Gabbana jacket comes in at about $5,500 below the median U.S. household income of $56,516 in 2015, the most recent year for which figures are available from the U.S. Census Bureau. As the Trumps traveled through Saudia Arabia, Israel, Italy, Brussels and then back to Italy, the president left it to top aides in Washington to explain the details of his federal budget proposal for 2018. Trump has proposed a $4.1 trillion spending plan that slashes safety net programs for the poor, including food stamps and Medicaid, while spending billions more on the military and protecting retirement programs for the elderly. 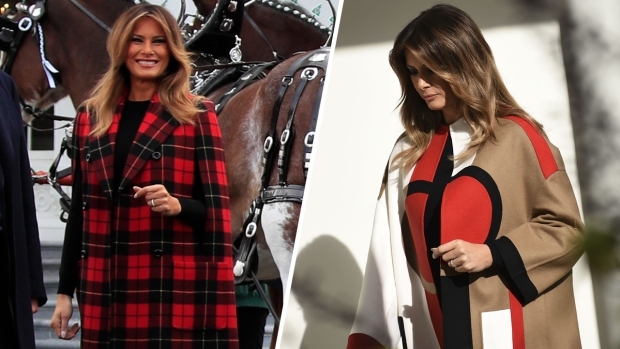 The fashion choices of America's first ladies are a longstanding source of public fascination, and Mrs. Trump is getting a taste of that on the trip, her first extended period in the public eye since her husband took office in January. She lives mostly at their penthouse at Trump Tower in New York with their 11-year-old son. The president has said they will move to the White House after the school year ends. First ladies are almost always criticized or praised for whatever they wear. Michelle Obama, for example, received rave reviews for most of the gowns she wore to White House state dinners that she and her husband hosted. But she was also mocked for some fashion choices, including wearing shorts on Air Force One and sporting designer sneakers that cost more than $500 to a food bank.